Opening: Saturday, Oct. 16, 2004, 7-10 p.m. 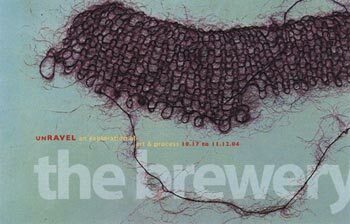 The Brewery Project presents "unRAVEL," an exhibition of contemporary artists from California organized by Haven Lin-Kirk. work by 7 artists who investigate and manifest the ideas of process through their work during the time frame of the exhibition, also involving influences/others from outside the gallery."